Ancient Greece was not a unified nation, but a collection of city-states known as poli. Poli is the plural of polis. Polis is often translated as city, but there was a very important difference between an ancient Greek polis and a modern city. The ancient Greeks saw themselves as citizens of their poli no matter where they lived. If a person was born in Athens, he would consider himself an Athenian even if he had lived in another polis for many years. Most Greek poli consisted of a small walled area and the surrounding farmland, but some larger poli consisted of several small villages. The poli developed independently of one another because they were isolated by rugged mountains or were located on small islands, but the people of the poli spoke similar languages and worshipped many of the same gods. Each polis had an independent government. The word we use today for making decisions as a group is politics. Politics is derived from an ancient Greek word that refers to the Greek polis. The Greek poli had to depend on one another to survive. Many of the city-states developed alliances, called leagues, for protection against other cities and foreign invaders. Each polis contributed soldiers and ships to form a common army and navy. The Greek poli met every four years at a great athletic contest to honor the god Zeus. A period of four years in ancient Greece was known as an Olympiad, so the ancient Greeks called their contests the Olympics. During the Olympic Games, poli that were at war would suspend hostilities until the contests ended. 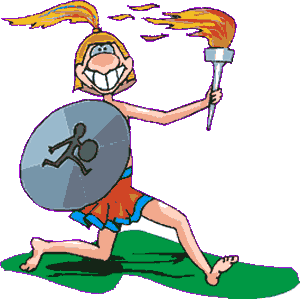 We don’t know when the ancient Greeks began told hold Olympic Games because the contests are older than any Greek writing. Today the spirit of the ancient Greeks lives on as most of the nations of the world participate in Olympic Games every four years. 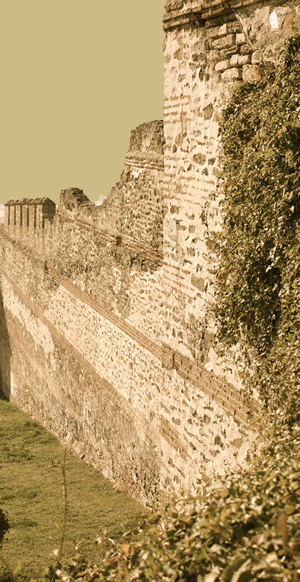 The Greeks built walls within their poli to keep out invaders.